ANNEAL: Definition: The process of slowly cooling a completed glass object in a kiln or annealing oven. This is an integral part of glassmaking because if a hot glass object is allowed to cool too quickly, it will be highly strained by the time it reaches room temperature; indeed, it may break, either as it cools or at some later date. Highly strained glass breaks easily if subjected to mechanical or thermal shock. You might be thinking “huh?” but you’re already very familiar with annealed glass. From light bulbs to drinking glasses, wine bottles to windows, shower walls and windshields, you’re surrounded by annealed glass every, single day. If you collect other forms of glass art like sculptures, vases and paperweights, they’re all annealed too. It’s such a standard part of glass manufacturing that we don’t even have to think or know much about it. Since glass isn’t randomly shattering or exploding all around us, we can just understand and assume that all professionally made glass has been properly annealed. So why is annealing the topic of the day? Because much like bead poop, it’s such a simple thing yet should be one of your key considerations when purchasing beads made by individual lampwork artists. Essentially, an annealed glass bead has had its interior stress removed and is therefore much stronger and more stable than an unannealed bead. Now, it’s still glass of course (and subject to all the many ways glass can be broken, chipped, crushed or misused) but after annealing, it’s the most durable piece of glass that each glass artist can create. And considering the investment required to purchase many of the most spectacular glass beads on the market today, it’s becoming an increasingly important issue. Ok, so how are beads annealed? Beads are annealed by placing them in a kiln (or annealing oven) usually heated to between 900-1100°F and slowly running them through a controlled cooling cycle. During this cycle the kiln heat is maintained at a consistent temperature to ensure the interior of the bead cools at the same speed as the exterior, thus strengthening the glass by eliminating all interior stress. 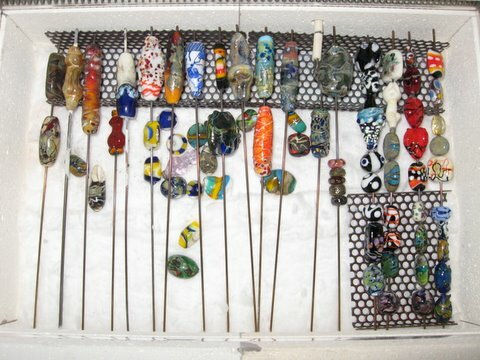 Sometimes beads are placed in the heated kiln straight from the torch, while other times they are cooled in vermiculite (or some other insulating material) first and then run through the kiln annealing process at a later date. This latter process is called “batch annealing”. Different types of glass require different cooling cycles. The annealing schedule is calculated from technical information based on the type of glass, size and thickness of each glass bead. For my beads, the cycle typically takes about eight hours. What happens when glass beads are not annealed? Due to their much smaller size, unannealed/improperly annealed beads are more likely to just split in half rather than shatter or explode. If it’s a sculptural bead, then it may eventually lose an appendage or two… or three. Not from being dropped or banged, just while it’s sitting there minding its own business. Come on, it’s just a bead. Is all this fuss really necessary? Because the field of contemporary lampworking is still so new, there is still much debate regarding whether kiln annealing should be accepted as a standard part of the glass beadmaking process. Commercial glass manufacturers, glassblowers and the makers of other larger scale glass art forms don’t debate this issue. It’s a given. Due to the larger scale of their creations, the impact of breakage due to improper/no annealing is much greater, often leading to quite explosive (and hence more dangerous) results. Can you imagine the effect of a large glass vessel or sculpture suddenly splitting into pieces? There’s now a growing movement in the international glass beadmaking community to encourage all glass artists to anneal any beads made for sale. Ongoing efforts are also being made to educate and encourage new artists of the importance of adapting kiln annealing as a standard part of their beadmaking process. Do you anneal your beads? Yes, I do. When I first started collecting (and then making) glass beads I really didn’t know or understand what all the annealing fuss was all about. Then the beads I was making started to break – not all but some. I didn’t much care then because they were my newbie beads and really? …kinda fugly. However, once my skills improved and I was spending 30-60 minutes or more on a single bead, I began to realize how much work is involved in creating a quality bead and my attitude changed. I went online and after exhaustive research found out enough to understand why my beads were breaking. From there, it was an easy decision buy a kiln and begin annealing my beads. (If you’d like to see what my kiln looks like, check my Studio Page). So, tell me again. Why exactly does a glass bead need to be annealed? Glass has to be heated to a molten state before it can be manipulated into a piece of art. If the piece is allowed to cool at room temperature (or below its strain point) then the exterior of the glass cools at a faster rate than the interior creating a form of internal tension referred to as “stress”. Although stressed glass looks the same to the naked eye as annealed glass, it is neither as strong nor as stable and can be subject to breakage at any point. Large scale glass pieces often must be annealed over a period of days, weeks or even months to remove the internal tension from the creation process. A typical glass bead can be annealed over a period of just a few hours. Before today, you may never have heard nor cared about annealing. 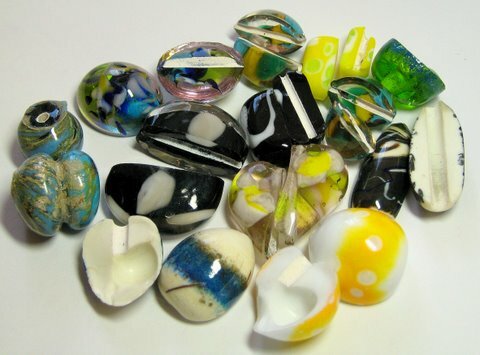 Now that you know more, you’ve moved one step closer to becoming an informed collector of artisan glass beads. Due to their beauty, intricacy and uniqueness, artist-made beads have raised little bits of glass from simple adornment to valuable representations of contemporary art glass. People (like me) who were once happy with an inexpensive string of mass-market glass beads will now spend hundreds (or for some, thousands) of dollars to purchase a single bead from their favourite artist. And now, knowing that your artisan glass bead is not only beautiful but also professionally annealed to make it as strong, durable and stable as possible…? Well, (as Martha would say) that’s a very, very good thing. Questions? Leave a comment or send me an email at evelyn@shebamakeda.com.